E-Ink Part Deux: blueChute | OhGizmo! This eBook from E Ink has a bunch of features worthy of a concept, but unlike most concepts, it’s actually physical and almost works as advertised. It’s 5mm thin (which is thinner than an iPod Nano, if you’re counting), has a nice big 800×600 display as well as Bluetooth (for data streaming from a cell phone) and a micro SD slot. In the works: a flip out reading light (since e-ink displays don’t produce their own light) and solar cells for recharging while reading in the sun. I think we can all agree that reading books is not going to be the main attraction of eBooks for a while yet, simply due to their physical nature. So let’s give up on that, and just appreciate it for what it should be: a personalized, self updating, newspaper. Don’t know about you but I’m *very* much interested in a dedicated ebook reader. Right now I’m using my trusty Dell Axim x51v. It does okay, but the screen’s a bit small and I get eyestrain. These larger 6-inch and 8-inch e-ink displays are far more comfortable on the eyes, and they do just fine for anyone who wants to read ebooks, graphic novels or listen to audio books. Plus, the e-ink displays allow for several *DAYS* of operation on a single charge of the 800mAh batteries. Of course, if one would rather shlep around a hefty paperback or hardcover, one can. 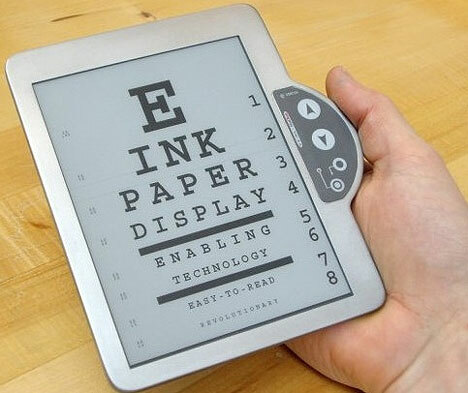 BTW, I know wherefore of I speak as I’m evaluating e-ink based ebook readers for my company.